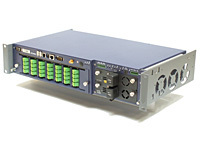 Rack-based unit for the Remote Fiber Test system that combines OTDR and optical switch technology to allow a single OTU-8000 to test hundreds of fiber links within a 40,000 km2 area. The OTU-8000 Optical Test Unit lies at the core of the JDSU optical network management system (ONMSi). Combining optical time-domain reflectometry (OTDR) and optical switch technology, a single OTU-8000 unit can automatically test hundreds of fiber links within a 40,000 km2 area on different types of networks (Core, Metro, Access, FTTH). When a fiber fault occurs, ONMS reports the location relative to the nearest landmark.